Emerald Art Deco Stunner - Need HELP! Discussion in 'Colored Gemstones' started by AMRN0516, Jan 9, 2019. Found this pretty lady on 1st dibs. I'm a NOOB who likes deco - I've got a thread over on rocky talky because this time, I want a diamond. I saw this one a few weeks ago and I can't stop thinking about it. Can anyone give me feedback??? I LOVE IT. For an ERing. Pass, or get photos where you are looking directly down on the gem on someones hand (make sure the photo is dead on, so the gem is not tilted at an angle) and a lab report. It almost cettainly has a window and looks suspiciously clean to me. Also emeralds are almost always treated with oil or a polymer infilling (which acts like a glue filling up fishers in the stone). You need a lab report to know what you are getting yourself into. What keeps drawing you in? Is it the design of the ring? The colored stones? Knowing this would help. I find the ring itself very pretty, but that poor, poor emerald is "cut" terribly and who knows what it's been treated with. I suppose if you don't mind those things, then by all means. 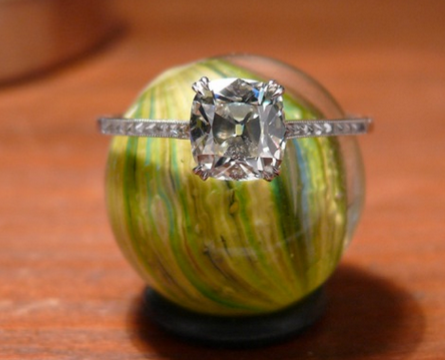 But I'd much rather find an emerald (that I know all about) and have a ring made that's similar. voce, strawrose and lovedogs like this.